CafePress hired Kaplow in spring 2008 to help the online retailer link its brand to major cultural events. Because CafePress allows users to design and sell merchandise online, events connected with self-expression are key, says Amy Maniatis, VP of marketing for the company. “Our... goal is to associate them with the biggest cultural moments,” says David Herrick, GM of Kaplow, AOR for CafePress. 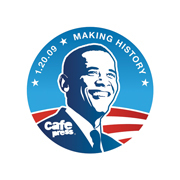 “We wanted to show CafePress as a barometer of public sentiment.” The team set out on an effort linked to President Obama's inauguration. The PR team used guerrilla marketing to target CafePress influencers through giveaways, events, partnerships, and an overall presence in Washington on January 20. “We wanted to align our brand purpose with authentic self-expression,” Maniatis says. By reaching out to people who attended the inauguration in Washington – generally the same consumer group CafePress is trying to reach – New York-based Kaplow hoped to secure international media attention with its branded efforts. CafePress partnered with Rolling Stone and Rock the Vote for two events, which had celebrity attendees like Adrian Grenier and Sheryl Crow. The team reached out to the Los Angeles Daily News, The Village Voice, San Francisco Chronicle, NPR, and Today to secure coverage of the effort, which included handing out branded buttons and drink coasters the day of the inauguration, and selling T-shirts designed by Rolling Stone artists online. Kaplow continues work with CafePress as its AOR.